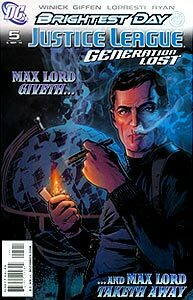 Cover Description: There are two covers to this issue: the standard cover by Tony Harris and JD Mettler depicts Maxwell Lord standing before a globe. The 1:25 variant cover by Kevin Macguire depicts Booster Gold in an action pose amidst laser blasts. Brief Synopsis: Booster Carter is faced with the consequences of his illegal gambling. In a previously unrevealed flashback, Michael Jon "Booster" Carter is being interrogated by the Gotham City police in the 15th Precinct regarding Booster's participation in an illegal gambling ring. The date is given as September 15, 2462. Based on the interaction between Booster and the unnamed police interrogator, this is likely the day that Booster was arrested for his alleged crimes. HIS STORY: The interrogating officer indicates that Booster Carter threw 5 touchdown passes in Gotham University's first game of the season against Michigan State. The collegiate record, at the time of the publication of this issue, is 11 touchdown passes in a game, set by David Klingler in 1990. The officer is also impressed by Booster's 80 rushing yards. The collegiate record for rushing yards by a quarterback in a game is 342, set by Matt Roe in 2004. Maybe it is just me, but this reads as though the officer is comparing Booster's bank account to a Swiss watch. What he means to be implying is that there is a clear and consistent pattern of Booster receiving money when he wins, "like clockwork." Hopefully Booster understood this faster than I did. Booster Carter has a rat tail hairstyle? Really? Despite the many previous origin stories, this is the first indication that Booster had such a style, and therefore is probably an error. HIS STORY: "Two Sundays ago," Booster Carter had a very bad football game against Miami. Given the caliber of teams that Gotham University plays, this is a presumably a reference to the University of Miami in Florida, and not Miami University in Ohio, though both have historically significant football programs. More notably, this means that the current football season is a minimum of 3 weeks old, indicating that by the 25th century, the college football season is underway in the blazing heat of mid August. Even more notably, it seems that in the future, college football games will be played on Sundays. In the 20th century, Sundays are generally reserved for professional football games while collegiate games take place on Saturdays. It would seem that in the future, the more things stay the same, the more things change. EXTRA, EXTRA: Error number 2: In the digital newspaper headline announcing Booster's arrest, Booster is erroneously seen wearing the number 7. 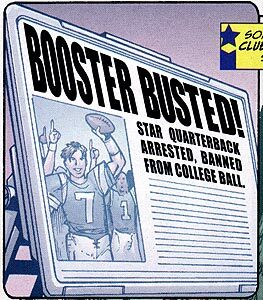 Booster's number as quarterback at Gotham University was 13. Boosterrific Review: I must offer full credit to the entire team producing this series: great work. I had my doubts, but you have all proven them unfounded as you continue to produce a highly enjoyable comic book. This issue is slower paced and largely character driven than some previous issues, two elements difficult to achieve successfully in an action-oriented series. My only complaints remain an uneven artistic rendering between issues, an understandable but disappointing situation no doubt arising from such a fast-paced publishing schedule. Lord's dialogue in this issue is a good testament to how bizarre and twisted his logic and ideas are. Another good issue; I've been very pleased with this series thus far. I loved this one, if only for Rocket Red's "hypocrite on Justice League, High Five!" line. it was my pick of the week when it came out. Very good issue. I am very interested in what Max Lord is doing here. The team is bonding together very nicely--though I am surprised by the lack of Fire and Ice bonding going on. While not the most action packed issue this stands as an example of how a comic should be done. Great art, excellent character voices and development (something that explains Ices' seemingly out of character voice.) It's well crafted and has every member of this team bonding in some fashion, something that seems to be a rare thing these days. Max has become a truly compelling villain of the piece. Captain Atom gets the most touching scene and the team starts to become a slightly tighter unit. Max's revelation totally threw me when I first read this, but it made sense an hour after I put it down. And I totally understand Ice. It's a testament to Judd Winick and Keith Giffen's writing that the protagonists' emotions are so real and vivid readers can easily slip into Booster's and Ice's shoes. The team is getting very good at making this. Cheers to them.